I’ll have more to say about this tomorrow morning, but for now I just want to make one point: gasoline isn’t shooting up to $5 per gallon. If you look at the most expensive grade, in the most expensive formulation, in the most expensive state, at the most expensive gas station, then a gallon of gas comes close to $5. 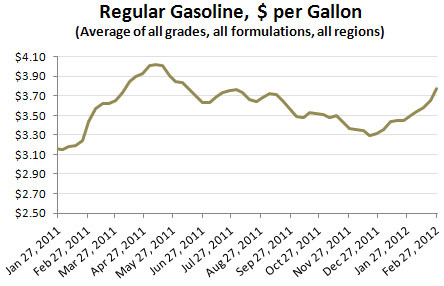 But the EIA publishes the average price of gasoline on a weekly basis, and as of this week it’s…..
Not five bucks. The price of gas is indeed up, and that’s bad news, but it’s not up that much, and it’s not at record-breaking highs either. As recently as last April, it was even higher. So everybody take a deep breath, OK?